How close is the world to ending extreme poverty? How close is each country to eliminating extreme poverty by 2030, in all its forms? Our new paper, “How close to zero?” considers this crucial challenge set forth in the Sustainable Development Goals (SDGs), as established by all countries at the United Nations in 2015. By extrapolating recent rates of progress all the way out to 2030, the results underscore both the depth and universality of the SDG challenge. 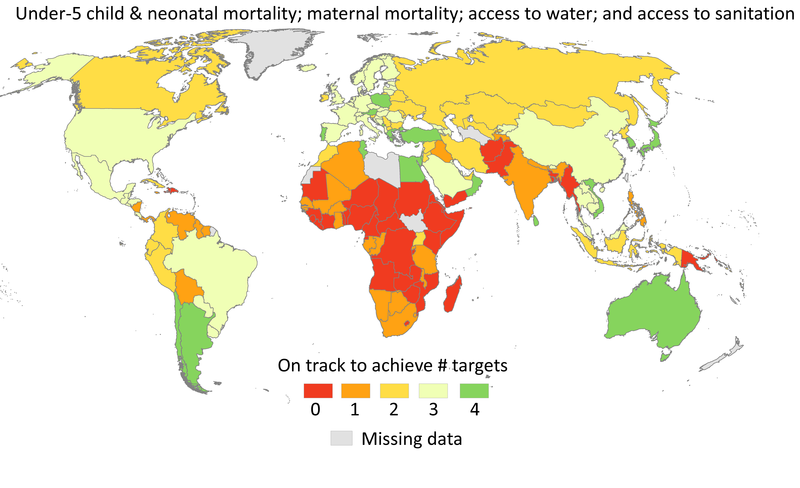 We consider country-level trajectories for six key SDG targets out to 2030: child mortality (under-5 and neonatal), maternal mortality, access to drinking water, access to sanitation, undernourishment, and primary school completion rates. Figure 1 summarizes the story across the first four of these targets, the ones with adequate country-level data to make worldwide projections. (We don’t include extreme income poverty due to data gaps.) The map shows that fully 154 countries are off track from meeting at least one of the benchmarks. This represents 80 percent of the U.N.’s 193 member states. Figure 1: How many of four key SDG targets are countries on track to meet by 2030? Remarkably, six high-income countries—Bahamas, Canada, Ireland, Slovenia, Trinidad and Tobago, and United Arab Emirates—are off track for two of the 2030 thresholds, while another 27 countries are off track for one. In most cases, these countries are close in absolute terms to meeting the targets, but they have seen relatively stagnant progress in recent years. This contrasts with many low-income countries that are making faster progress but still have substantial ground to cover by 2030. Our results also highlight the specific countries with the most severe extreme poverty problems to be overcome. 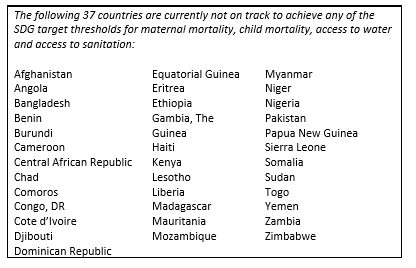 We find that 37 countries, listed in Figure 2 and colored red in Figure 1, are not yet on course to meet any of the four relevant SDG benchmarks. These are generally situations with both the furthest distance to cover and the greatest acceleration required in the national rate of progress. Our findings are only as strong as the official data sources they draw upon. Holding aside concerns about accuracy, there are major cross-country gaps even when looking at just the six SDG targets considered here, as alluded to above. For example, 78 countries are missing adequate data on undernourishment; 57 countries don’t have key information to assess trends on primary school completion. The data revolution for sustainable development remains an imperative, including in advanced economies. Ending extreme poverty is meant to be the first among equals in the multi-dimensional global challenge of sustainable development. To reach the 2030 targets, the world still needs to ensure every life counts equally, and that every key issue is properly counted.